In Moonlight Miles, Music journalist and Stones devotee Chris Epting takes you on a journey across the United States and Canada to the places that Jagger, Richards, Watts, Wyman, Jones, Taylor and Wood touched, from arenas, theaters and clubs to hotels, studios and off-the-beaten path sites, to celebrate a half century of the Rolling Stones. 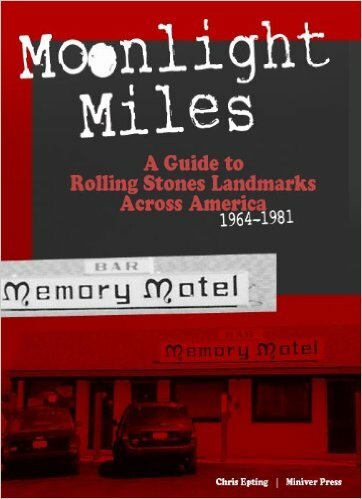 Loaded with surprising trivia, facts and lore, “Moonlight Miles – A Guide to Rolling Stones Landmarks Across America 1964-1981” retraces the steps of the Stones during their most productive and wildest years, as they made their tumultuous mark across North America, creating both musical magic and mayhem like no other band before or since. The Long Island motel that inspired one of the Stones’ most famous ballads. The Florida hotel room where Keith Richards awoke with “Satisfaction” in his head – now a Scientology headquarters. The Alabama studio where “Brown Sugar” and “Wild Horses” were born. The street corner where the band infamously posed in drag – in 1966. The building seen both in a famous Rolling Stones video – and a famous Led Zeppelin album cover. The 10th story hotel room where Keith Richards tossed a TV set out of the window.